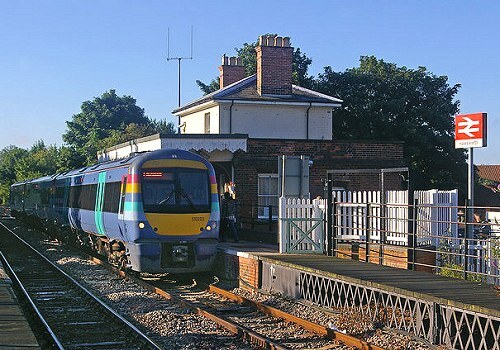 The nearest train stations to Southwold are at Darsham and at Halesworth, both about ten miles away and both on the East Suffolk Line which serves London Liverpool Street to Lowestoft, via Ipswich (change at Ipswich). The rail service is operated by Abellio GreaterAnglia. Their network map shows Darsham and Halesworth on the right hand side plus how these relate to stations in London, Norfolk, Essex (including Stansted Airport) and to other East Coast train services. Travelling from the London/Ipswich direction the train stops at Darsham first. This station is right by the A12 road with just a few houses and businesses close by. Darsham village is a distance away. If you are being collected by car most local people in Southwold or Walberswick would use Darsham station. Halesworth station (see photo) is the next station after Darsham and is within easy walking distance of the facilities of this small market town. Go to www.halesworth.net to know more. Halesworth station links to Southwold mainly by the bus service operated by Anglian Buses (timetables available on their website). The service operates between Halesworth and Southwold, calling at Halesworth train station, and will set down in Southwold High Street. If boarding the bus at Halesworth remember that the bus stop is on the ‘uphill’ side of the station, not the car park side. There are appropriate signs displayed.From Southwold there are several interesting bus routes to travel. A day ticket’ is reasonably priced. You can also see Blythweb’s own ‘Links’ section for other useful travel information links.